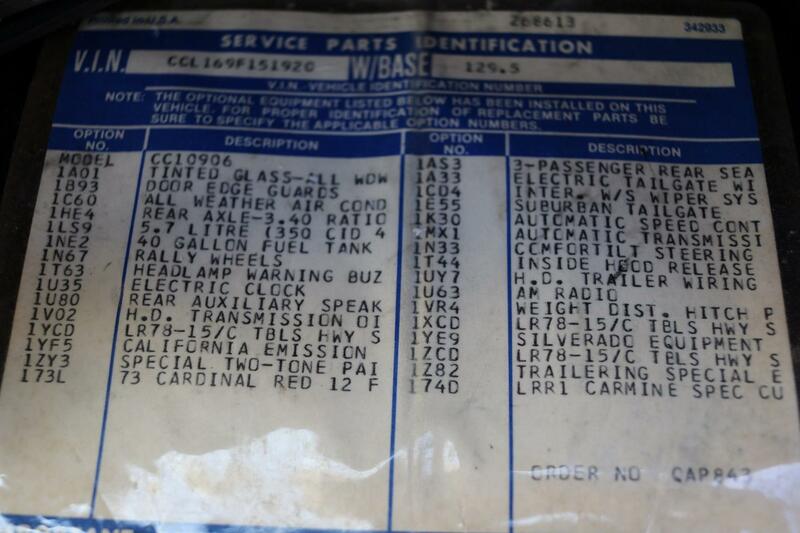 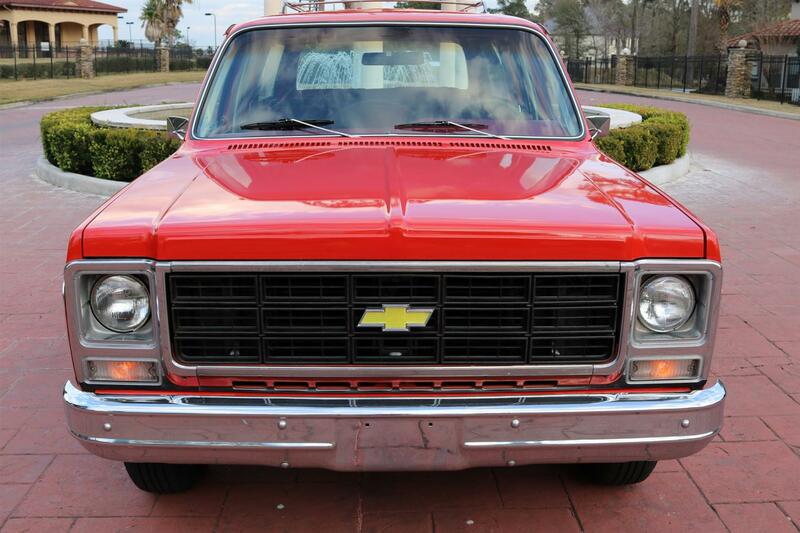 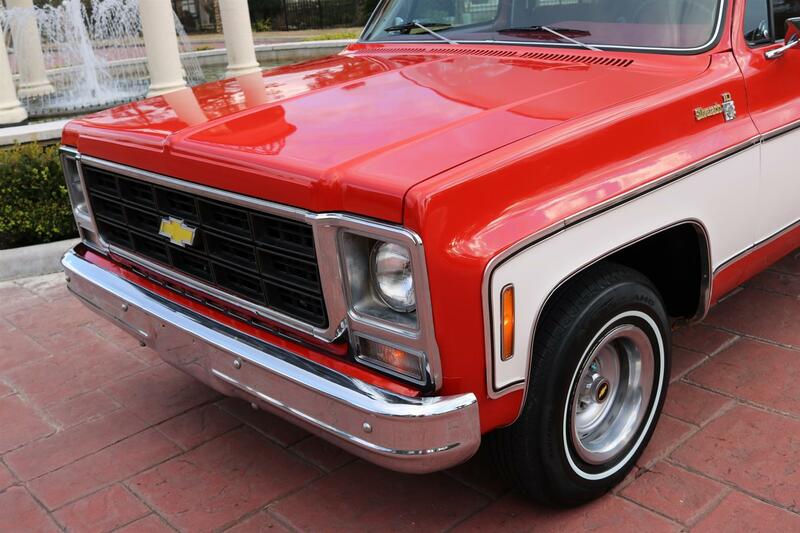 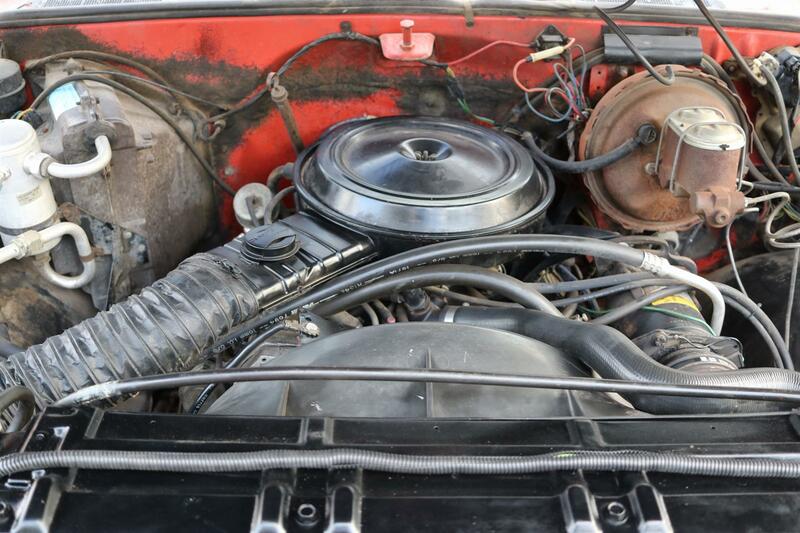 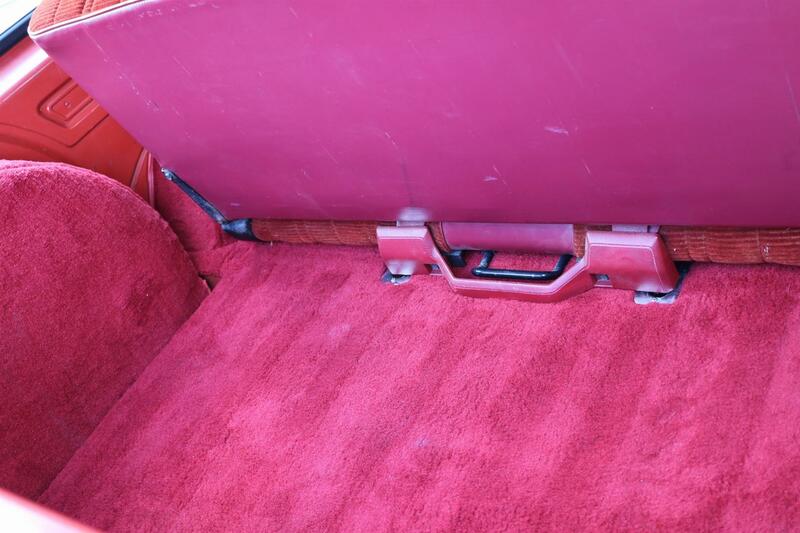 1979 Chevy C10 Suburban Silverado – 350, A/C, 3rd Row, Cruise Control, Power Windows/Locks, Highly Original, 1 Owner! 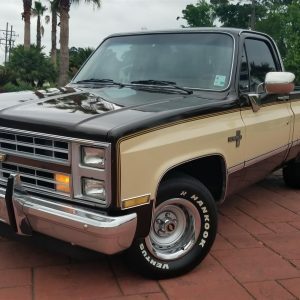 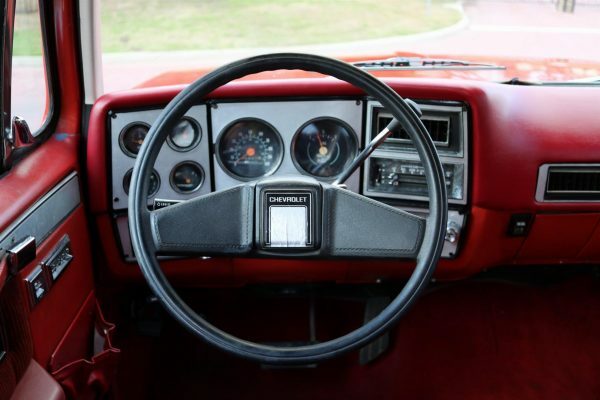 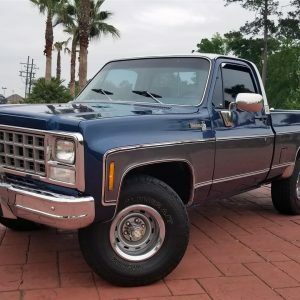 1979 Chevy C10 Suburban Silverado – All of GM’s light duty and medium duty trucks for 1973 featured new cabs and pleasingly squared-off styling. 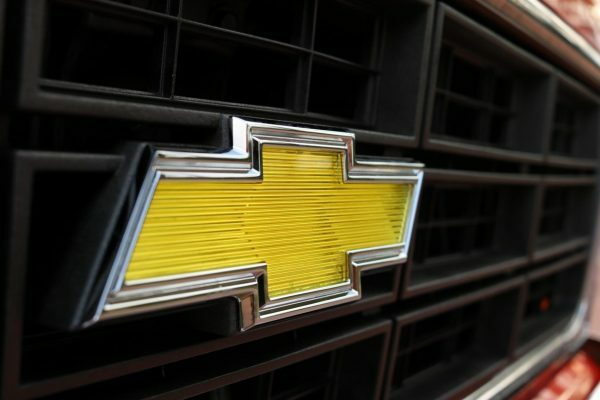 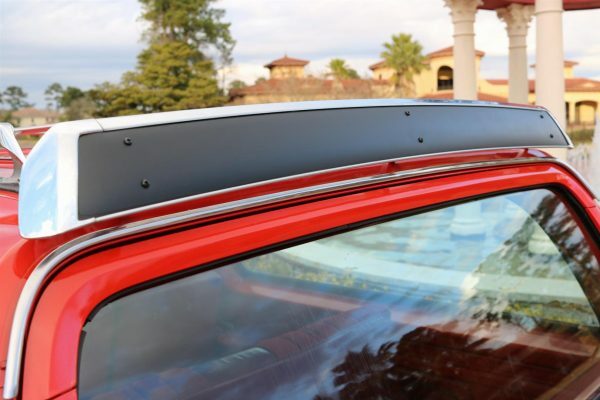 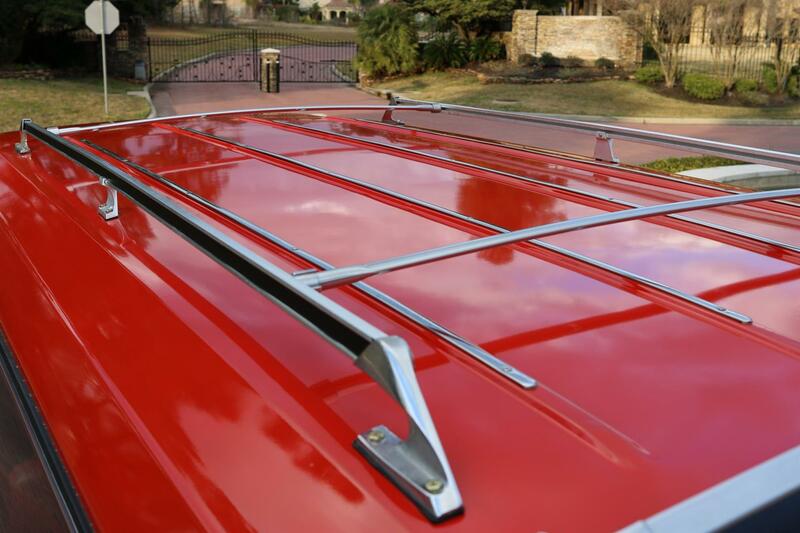 Building on the success of Chevrolet’s king-sized truck-based wagon, the biggest news for the new Suburban was the addition of a driver’s side rear passenger’s door. 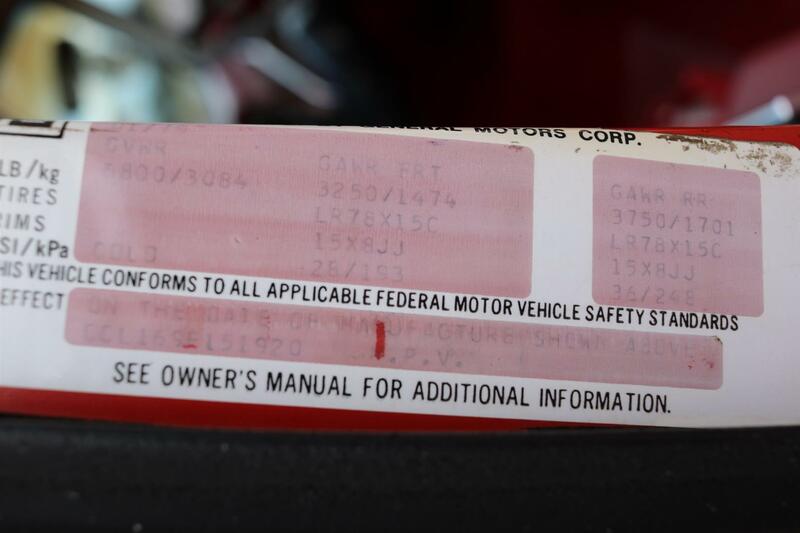 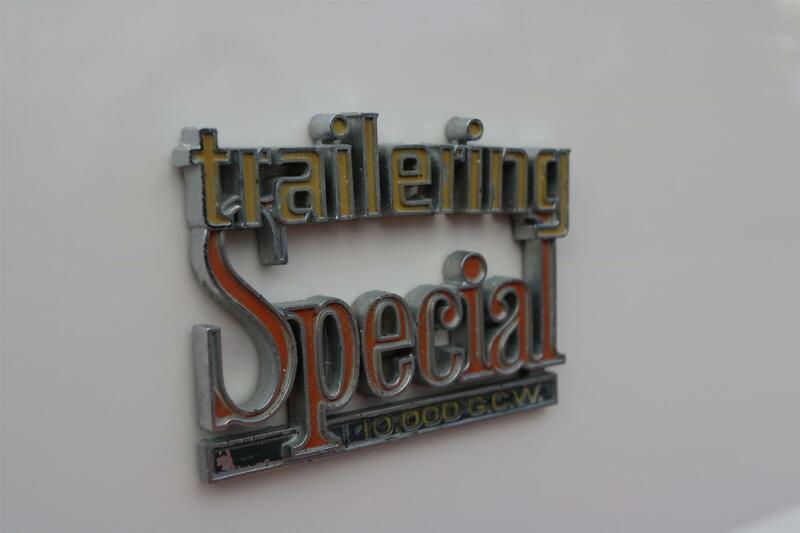 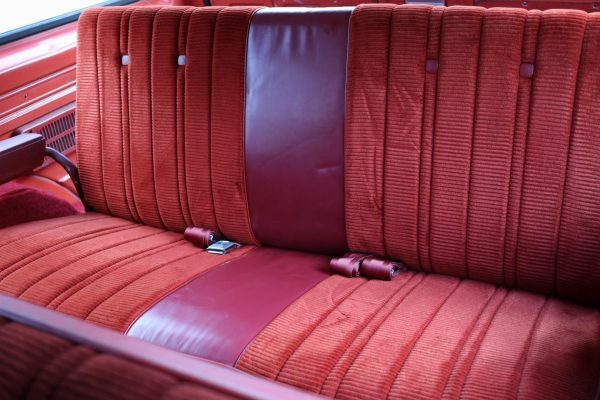 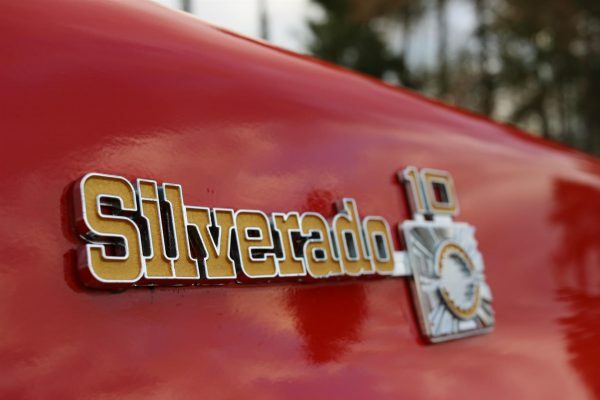 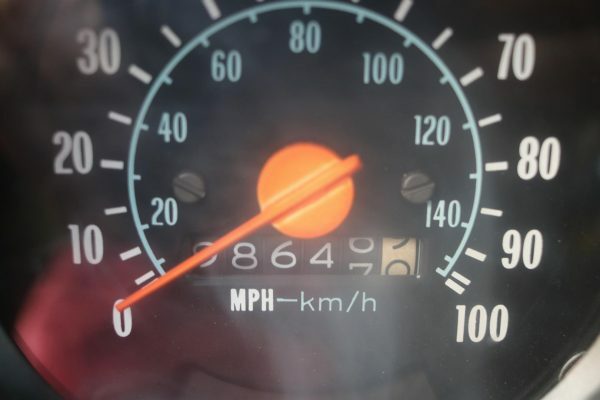 A feature that we take for granted today, it also came a dozen years after the competing International Travelall and a decade after the Jeep Wagoneer first offered theirs. 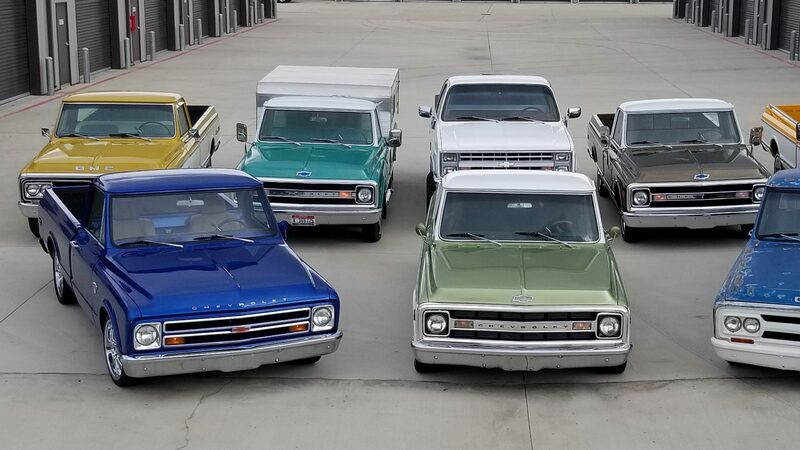 While GM may have been late to that game, they stayed for the whole game to play, as IH withdrew from the light truck market in 1975. In those two years, the Suburban not only made greater inroads with market share, they were successfully pulling in new owners who would have otherwise have been car owners. 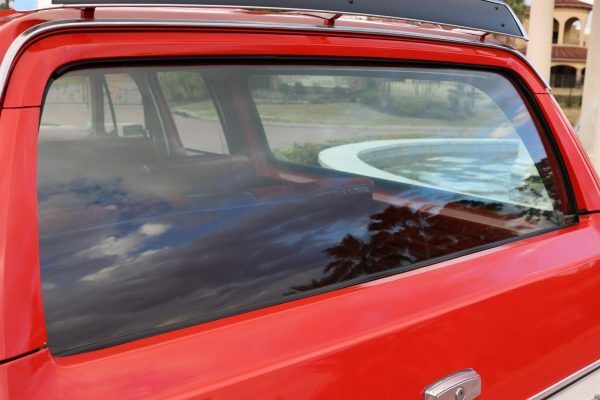 While some of this is due to the four-door arrangement, it is also due to the increasing number of car-like options such as air conditioning, power seats, power windows, tilt steering column and luxurious interior trim. For all years of this generation, the pickups and the Suburban all were available with the same trim packages – from bare bones Custom Deluxe to the well-appointed Silverado. 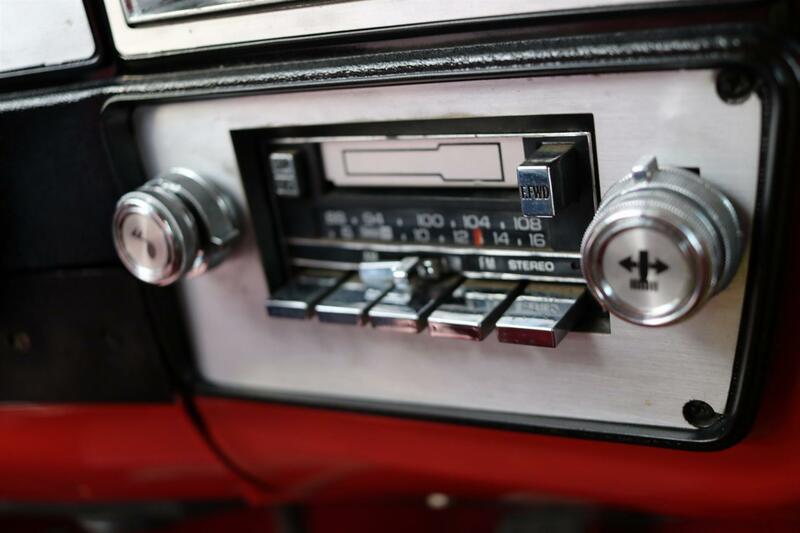 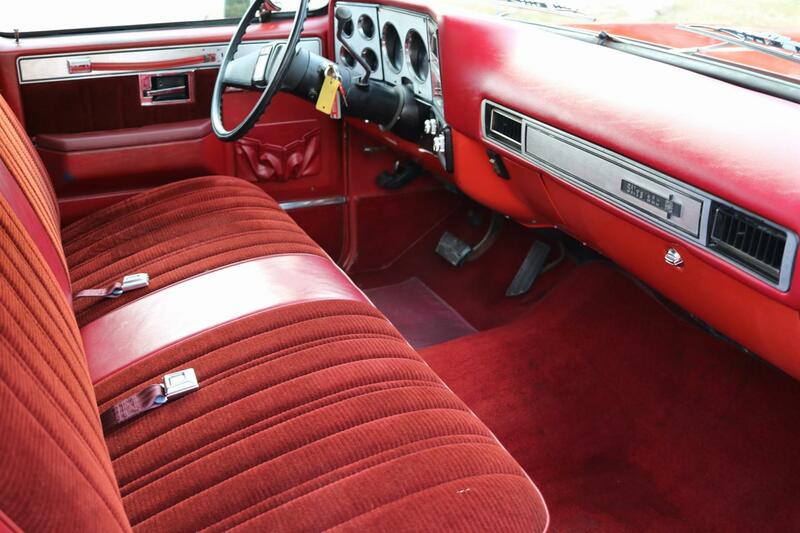 Classic Suburbans are hot and we’d be lying if we said we we’re in love with them! 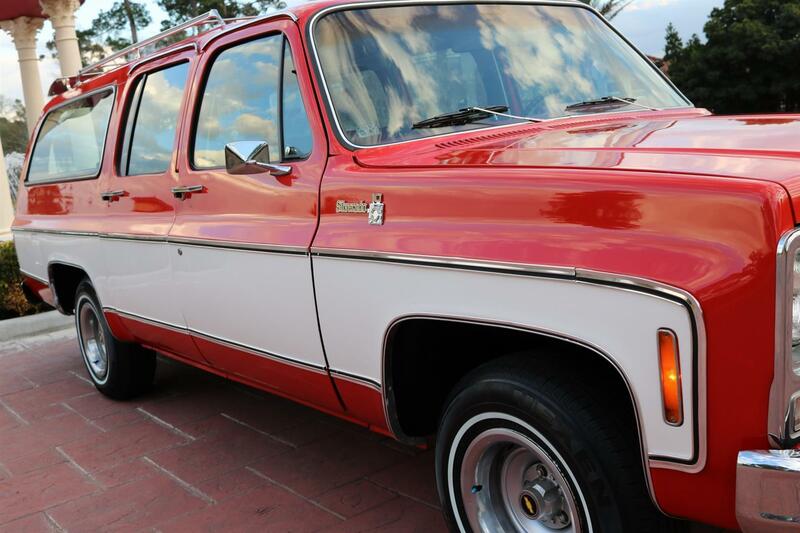 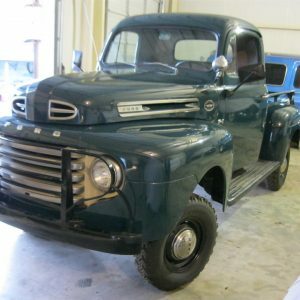 In our nationwide hunt for clean, original classic trucks/SUVs, we were elated to find this 1 owner beauty in CA. This Suburban drives great and just under 99k miles from new. 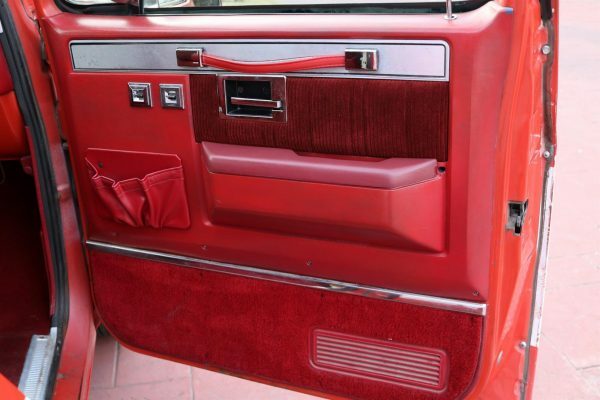 When we located this Chevy, the interior was super clean with exception of a spill that stained the rear trunk area and spare tire cover. 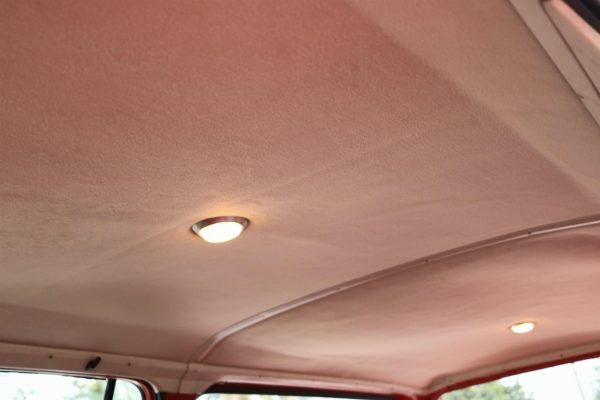 We professionally replaced the material in these two areas to get them up to par with the rest of the interior. 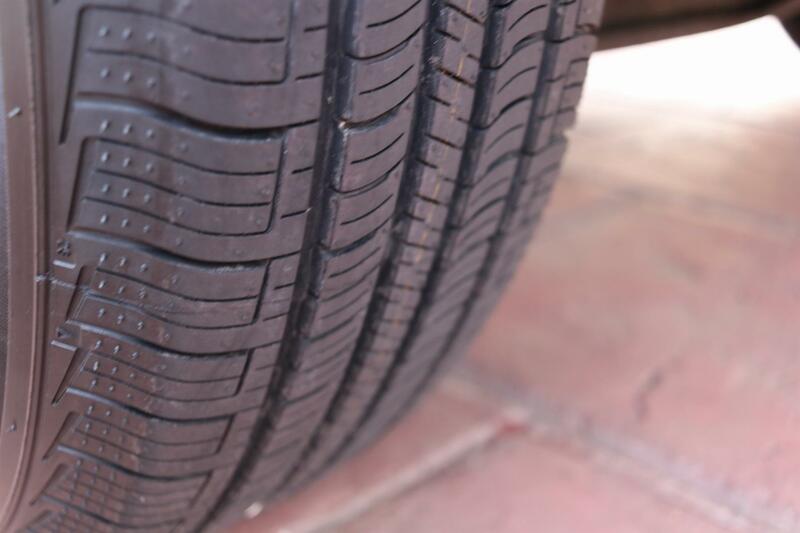 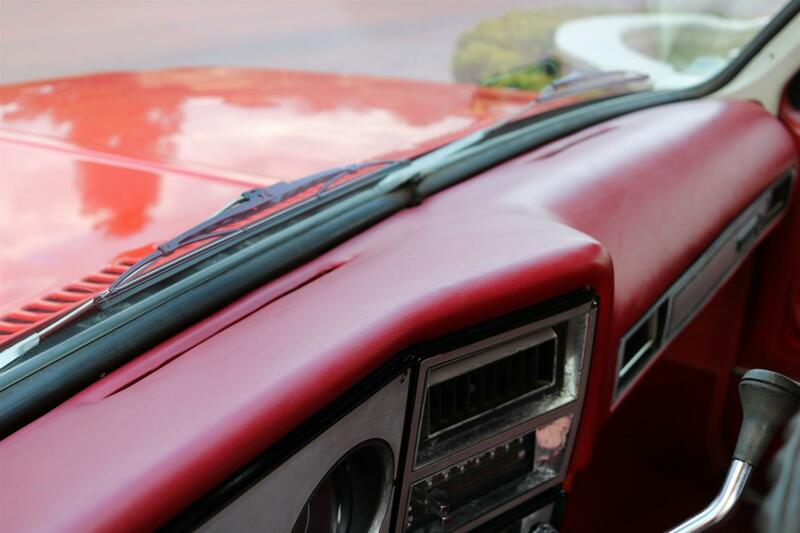 The exterior is very solid, straight and completely rust free. 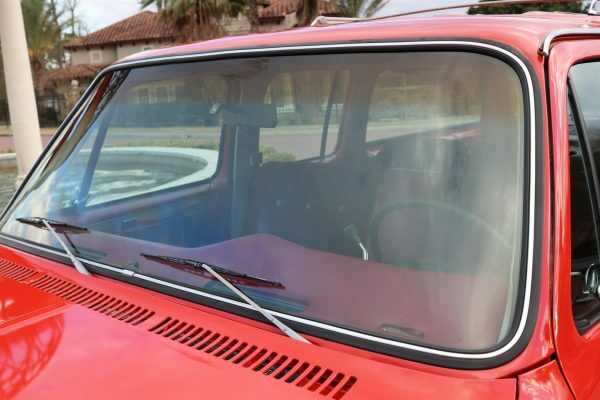 But, the hot California sun had done it’s damage to the entire upper surface of the vehicle. 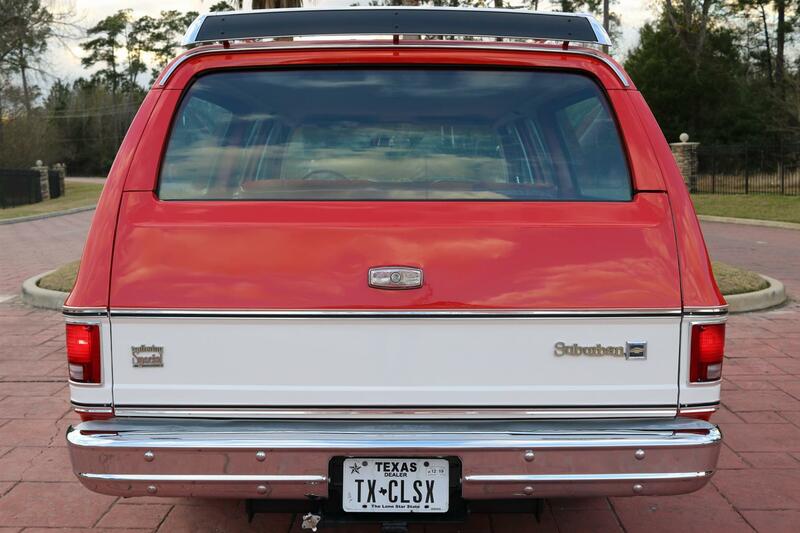 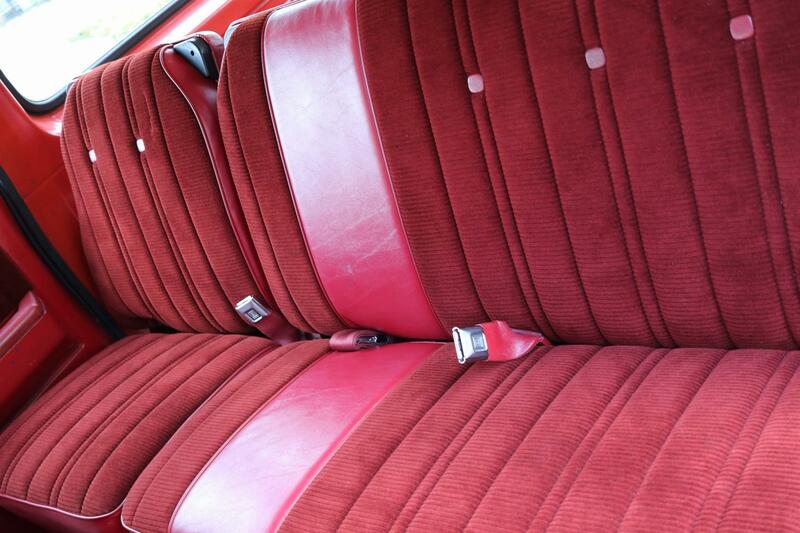 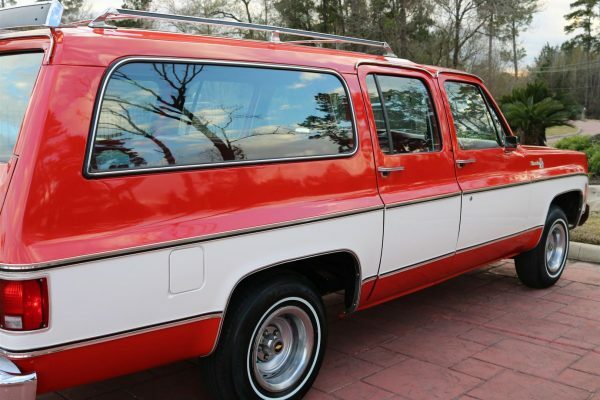 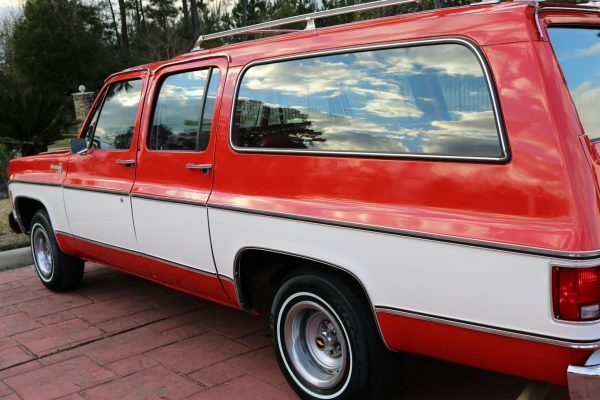 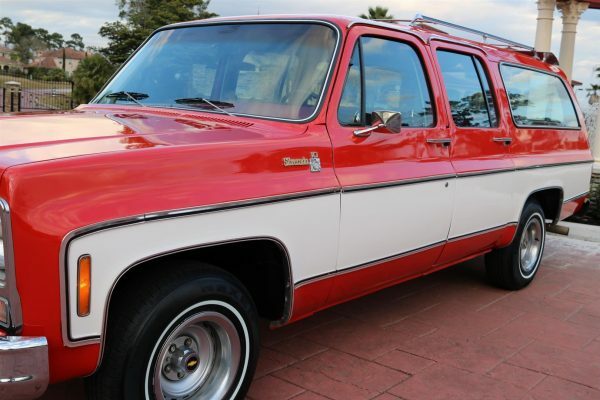 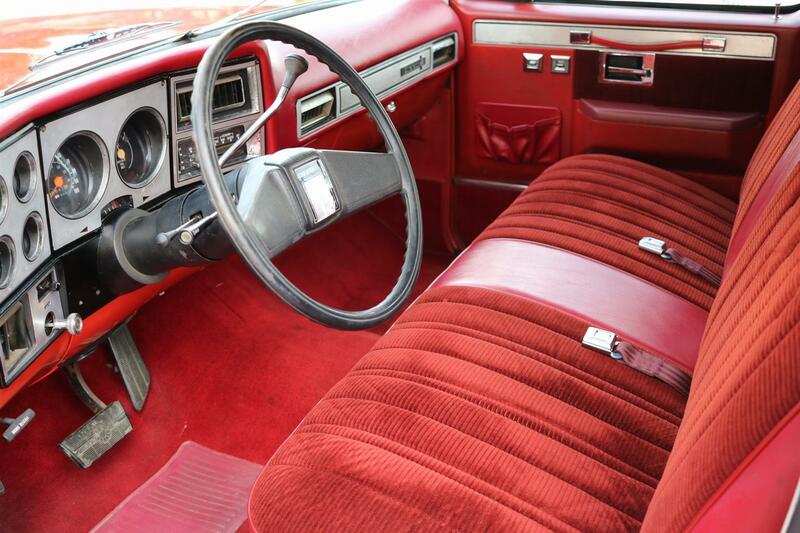 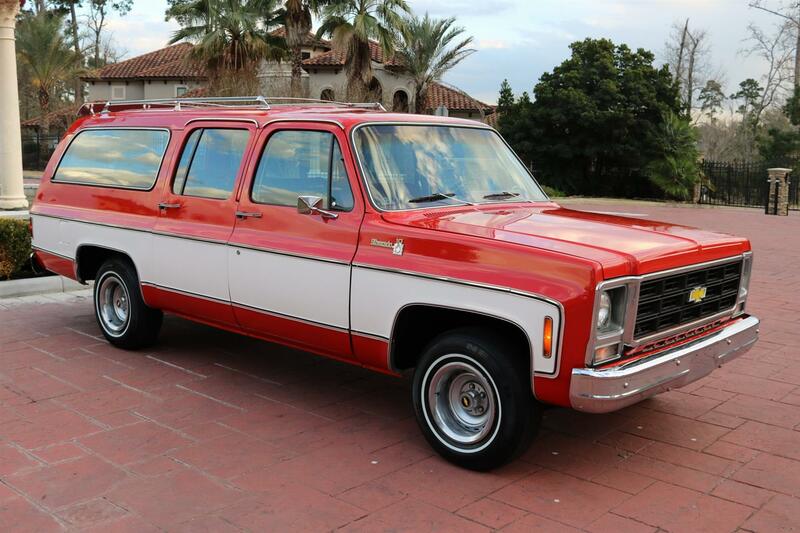 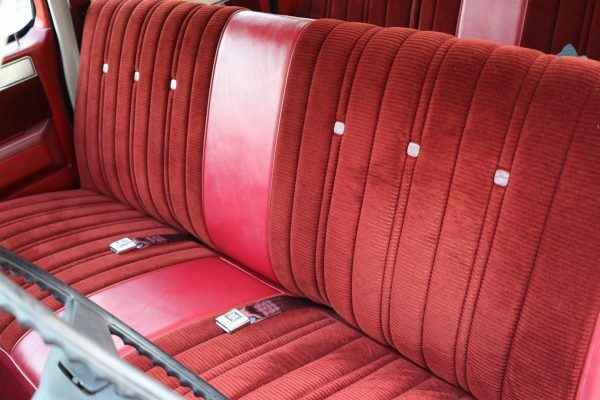 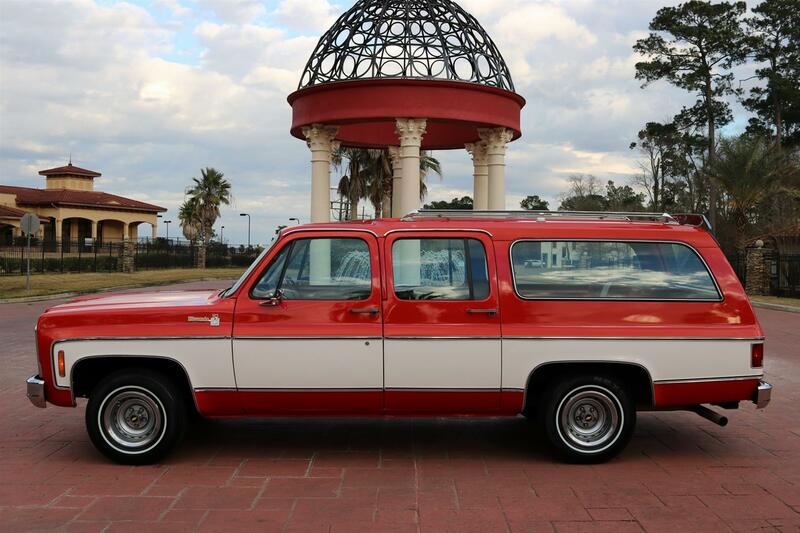 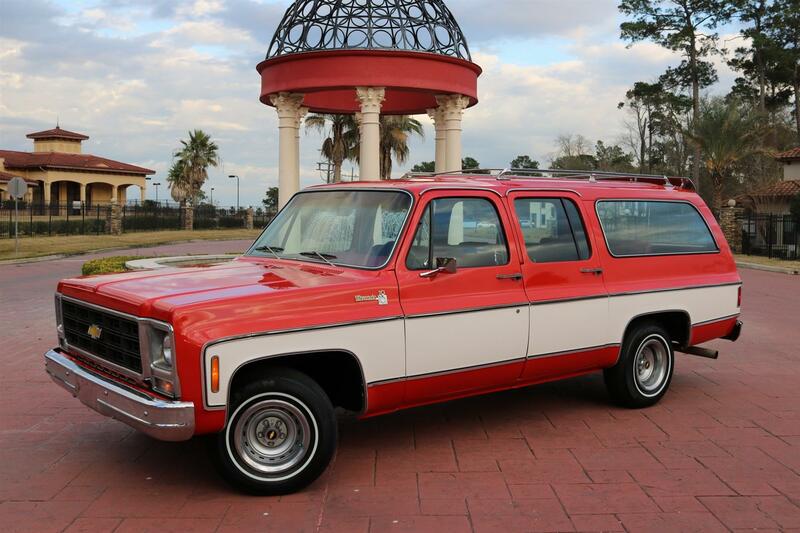 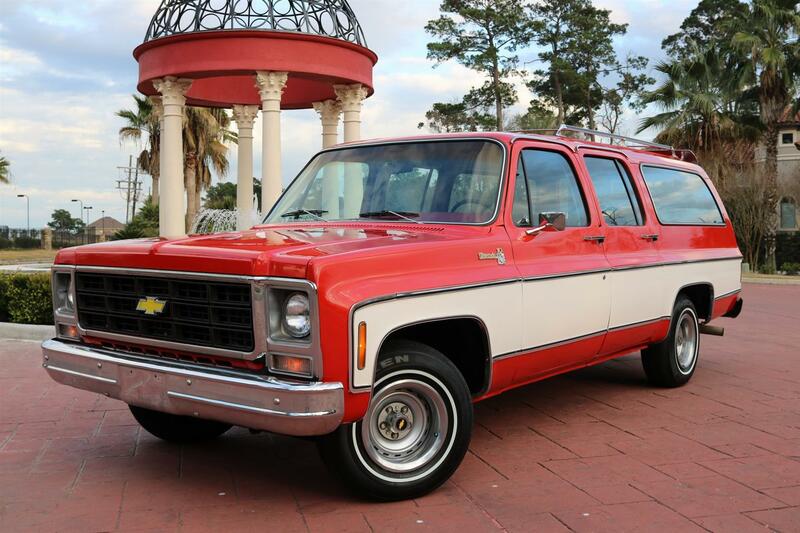 When the Suburban arrived in Texas we had it stripped and completely repainted in its original two-tone Cardinal Red & White. 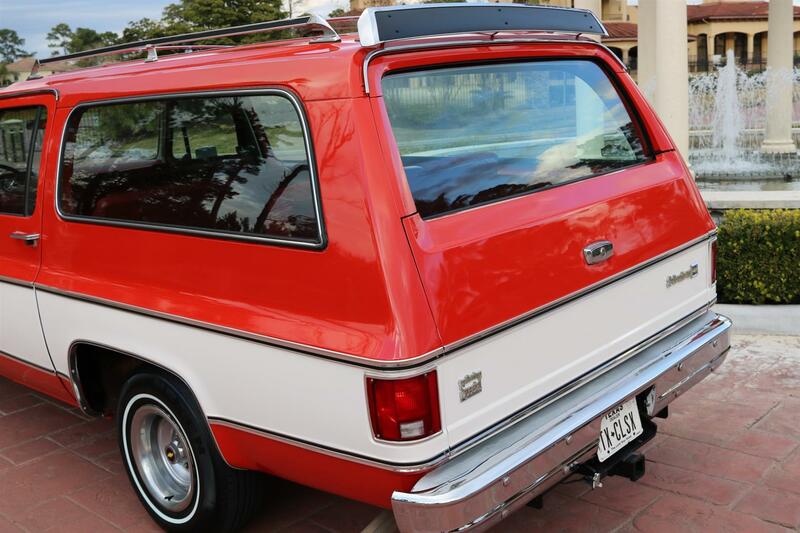 There was no point in putting the original trim over the new paint so that entire trim was replaced as was the rear bumper. 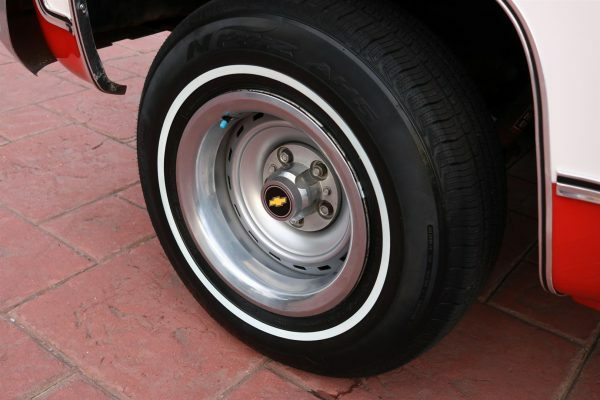 The final touch was a set of brand new white wall tires. 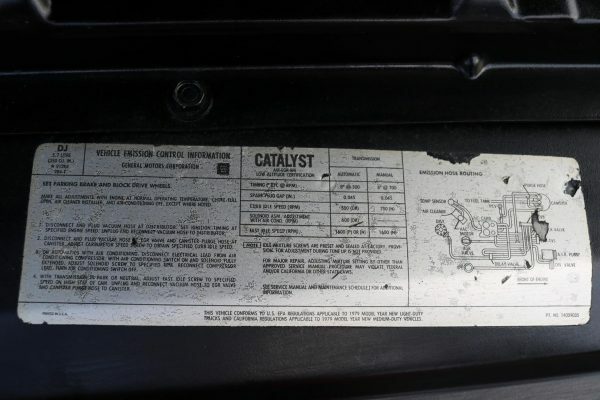 A complete list of features and options includes; 350 V8, Auto, RWD, A/C, Cruise Control, Luggage Rack, Owner Manual, Power Steering & Brakes, Power Windows & Locks, Power Rear Window, Factory AM/FM/Cassette, 3rd Row Seating, Tilt Steering, Tinted Glass, Trailering Special Equipment, Tire Tools, Spare Tire, 15″ Rally Wheels, and Brand New 235/75/ R15 White Wall Tires!